Mark Rose swung through Kelsey Brookes studio in San Diego a couple months ago to have a look at him working on his new show which opens this Saturday, Nov 10th down in La Jolla, CA. @Quint Contemporary Art. 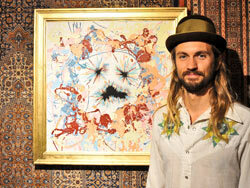 Kelsey Brookes recently opened a new show in Maibu, CA entitled Meditations on Symmetry, and the work is amazing. He'll be participating in the group show Cigarettes, Phone Cards, & Hip Hip Clothing opening Friday, April 20th @FFDG. More details on that forthcoming. RVCA got 4 houses on the North Shore this year and packed them with an eclectic mix of talented people. They asked me if I wanted to go (I do not know how I got included), I did and below is what happened. San Diego based Kelsey Brookes is set to open a solo show of new psychedelic art for London's The Outsiders Gallery on November 4th entitled Desires of the Soul. Here is a taste from Kelsey's studio. San Diego's Kelsey Brookes opens Caped Creatures at Berlin's Circle Culture Gallery Thursday, Nov 18th, and the work looks amazing. 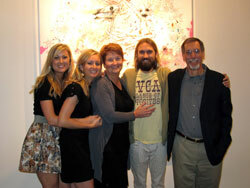 Solo show at Quint Contemporary Gallery in La Jolla, California which is near San Diego, CA. A look into the studio of this San Diego based artist as he prepares for his solo show @Quint Contemporary opening Nov 20th. San Diego artist, Kelsey Brookes, blogs up a recent trip he took there to do some live painting at the Green Room Festival in Yokohama. @New Image Art in Los Angeles. Mini interviews with the artists in our show Gold Rush which opens January 12th in Austin, TX @Okay Mountain Gallery.